"Chameleon Day" redirects here. It is not to be confused with Chameleon Days. 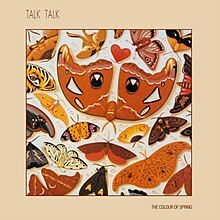 "I Don't Believe in You"
The Colour of Spring is the third studio album by English band Talk Talk, released in February, 1986. Musically, The Colour of Spring was a major step away from the synthesised pop of early Talk Talk, with a greater focus on guitars, pianos, and organs on such songs as "Life's What You Make It", "Living in Another World" and "Give It Up". It had a sound described by the band as much more organic than their earlier records, with the improvisation that was to dominate on their later works already apparent in the recording process. The album cover was designed by James Marsh, who also designed the band's other album covers. The Colour of Spring became the band's highest selling non-compilation studio album, reaching the Top 20 in numerous countries (topping the Dutch charts), including the UK, where it reached No. 8 and stayed in the UK charts for 21 weeks. It did not quite match the sales of its predecessor in the United States but was nonetheless their last album to enter the Billboard 200, reaching number 58. With its international hit "Life's What You Make It", Talk Talk expanded their fan base, and it earned the band the third of their three American hits, along with 1984's "It's My Life" and "Such a Shame". All tracks written by Tim Friese-Greene and Mark Hollis. ^ Unwin, Neville; Goodyer, Tim (April 1986). "Talkback". Home and Recording Studio. ^ Marsh, James; Roberts, Chris; Benjamin, Toby (2015). Spirit of Talk Talk (Paperback ed.). London: Rocket 88. p. 74. ISBN 9781906615956. ^ Woodstra, Chris. "The Colour of Spring – Talk Talk". AllMusic. Retrieved 6 August 2015. ^ Larkin, Colin (2009). "Talk Talk". The Encyclopedia of Popular Music (4th ed.). Oxford University Press. ISBN 0-199-72636-1. Retrieved 26 August 2016. ^ Eccleston, Danny (May 2012). "Lost Horizon". Mojo. London (222): 100. ISSN 1351-0193. ^ "Talk Talk: The Colour of Spring". Q. London (211): 119. February 2004. ^ a b "Talk Talk Chart History (Billboard 200)". Billboard. Retrieved 18 June 2018. ^ The Colour of Spring (Liner notes). Talk Talk. EMI Records. 2012. pp. 2–5. ^ "Austriancharts.at – Talk Talk – The Colour of Spring" (in German). Hung Medien. Retrieved 18 June 2018. ^ "Dutchcharts.nl – Talk Talk – The Colour of Spring" (in Dutch). Hung Medien. Retrieved 18 June 2018. ^ "Longplay-Chartverfolgung at Musicline" (in German). Musicline.de. Phononet GmbH. Retrieved 18 June 2018. ^ "Charts.org.nz – Talk Talk – The Colour of Spring". Hung Medien. Retrieved 18 June 2018. ^ "Norwegiancharts.com – Talk Talk – The Colour of Spring". Hung Medien. Retrieved 18 June 2018. ^ "Swedishcharts.com – Talk Talk – The Colour of Spring". Hung Medien. Retrieved 18 June 2018. ^ "Swisscharts.com – Talk Talk – The Colour of Spring". Hung Medien. Retrieved 18 June 2018. ^ "Official Albums Chart Top 100". Official Charts Company. Retrieved 18 June 2018.